What Ivan does is brilliantly delve into the data that’s freely open on the internet to show patterns and information in ways that we might not have noticed if looking at the data in its raw format. The problem that Ivan has, is there’s not always that much information about Africa to use – in fact, some of his maps show big blank spots for countries on the continent with no known data for them. In Kenya, Ushahidi is working on a project about public service delivery and the companies and government entities responsible for them. I’ve become painfully aware of just how inaccessible Kenya’s government data is. The entities that hold the most public and infrastructure data are always government institutions. Getting information from them, no matter where you are in the world can be difficult. In Africa it can be very hard indeed. For good reason too, the fact is that there are decisions made for and by politicians for themselves or their constituencies that they don’t want you to see. Having that data open, and visualized, can be damning. Tonight we had the Permanent Secretary for Information and Communications, Dr. Bitange Ndemo, at the iHub for a session that he wanted to hold on using Kenya’s government data for local applications. Dr. Ndemo might be the hardest working and best intentioned person in government that I know. He truly wants to see tech move the country further, faster and with everyone taking part. Open data is an idea he’s been championing for quite some time. However, we have a problem… A couple of them actually. There is a lot of Kenya data, most of which resides in the Ministry of Planning, but that data isn’t accessible. We don’t know who to go to to get the data we need, and there is no mandate to support one group to centralize it. Major data sets, like Kenya’s 2009 census data, are open (technically), since you can purchase the 4 books at $50/each and get it. That’s not really usable or accessible by many people though. We don’t have a format for the data, it comes in anything from PDFs to Excel to CSV and books. Groups like the Ministry of Education might publish some information on schools, but they won’t give anyone the location data. In fact, location data is the most hoarded information, rarely getting published in even a hardcopy format. 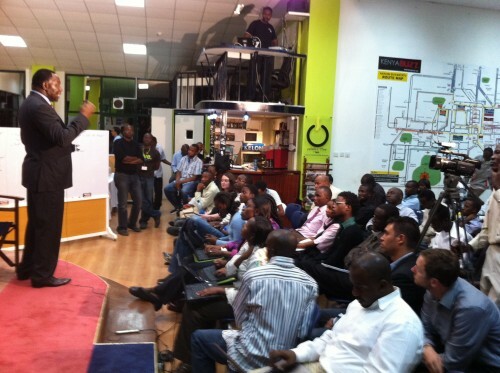 Google has partnered with the Kenya government to show some of the data. The question is, why is one multinational given access to all this information, while Kenyan citizens or organizations can’t get it directly? Is it just the same data as the World Bank has in their excellent open data API, or is there more data visualized here than that? I hope that the Kenyan government will look closely at what the W3C has provided, and at what Sir Tim Berners-Lee advocated recently in regards to open data. I know that Dr. Ndemo is talking to many stakeholders on this, and my hope is that people step up and step forward to ensure that the data is open, accessible and usable – and soon. Kenya is just one example, across Africa much of the corruption and misinformation can be attributed to governments who purposely withhold data in order to further their own aims, not those of their constituents. Instead of being scared about what people will “find out” about them, these governments would do well to look at all the benefits of government open data initiatives. Allow me to propose one more problem we seem to have :- inability to understand the supply chain for Govt. Data for many of us. Eg. Data flow can appear viscous where govt. officials are not trusting of data from their very own systems. That would make them apprehensive to share it. I often had to resist such temptations when I was a govt. official. Weak entreprise information management systems in govt. may be significant contributors to the problem of data viscosity. There also seems to be a need for many of us to understand the monitoring and evaluation approach that most govt. and donor driven projects use for data management. It seems like a need to appreciate data generated from routine monitoring systems vs data from studies and surveys. This understanding seems important in telling how to visualize/interpret respectively generated statistics. Have you considered talking to the folks at http://sunlightlabs.com/? They have been doing similar work in the U.S. for a few years now. I agree with you that the government isn’t open to its data, am sure they have data dating back to the 40s. you cant just walk in to a ministry’s office as a concerned citizen and seek to acquire any information. mostly we are left to rely on independent studies and surveys.